, the Nigerian 'Man of God' with close links to President John Evans Atta Mills, has flaunted his role in the Satellites' triumph, declaring that he is the brain behind the victory of the newly crowned World Under-20 champions. With President John Evans Atta Mills already acknowledging his role as the power behind the throne, of the Synagogue Church of All Nations (SCOAN) has himself revealed his own side of the story. President Mills' spiritual father, apparently playing God, divulged to Complete Sports, a Lagos-based sporting newspaper in an interview at the church premises on Saturday that Ghana's President, Professor Atta Mills, and Black Satellites coach, Sellas Tetteh, were constantly in touch with him on Friday morning (match day), for prayers and counseling. According to him, “Mr. President and the coach were constantly in touch with me on the morning of the match. We talked severally before, during and after the match. I told them that they should remain focused on the task ahead of them, with a special warning that they should not hustle to score a goal in regulation time. I warned that if they should look for goals, they will end up losing the game. “They called me again at half time and I repeated the same thing. This time around, I specifically told them to rush things as the match will be settled after extra time. That means after 15 minutes of two halves. “When the penalty kicks were about to start, they called me again to ask how it will go. I just told the coach that he should allow his number 10 (Andre Ayew) to take the first kick and they will end up winning the game. 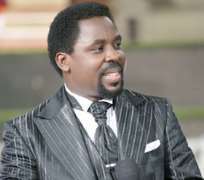 It would be recalled that the revered man of God had predicted correctly, matches involving the Super Eagles recently. On the list are the matches between Ghana and Nigeria at the Nations Cup in 2008, Nigeria versus Tunisia and the crunch tie between the Super Eagles and Mambas of Mozambique.